Home / Entertainment / Wizkid honoured with Oct 6 as 'Wizkid Day' in America. 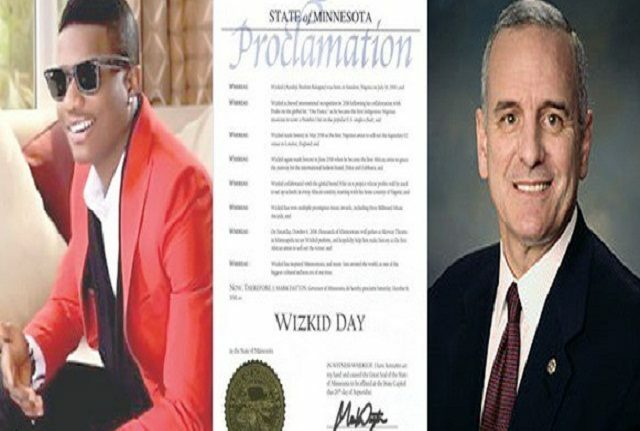 Wizkid honoured with Oct 6 as 'Wizkid Day' in America. Award winning Artist, Ayo Balogun populally known as Wizkid, has bag an honour in the United States by the governor of Minnesota, Mark Dayton. Dayton, dedicate Oct, 6 of every year as Wizkid day. According to the proclamation on his tweeter handle @wizkid, the artiste becomes the first African artiste to sell out Skyway Theatre on Oct. The only other artist who has achieved same feat in Minnesota, is Beyonce . Wizkid who just released “Fever” and “Master Groove”, he’s currently on tour in America. NAN reports that Wizkid, recently walked the runway at the Dolce and Gabanna show in Milan, Italy. He strutted alongside supermodel Naomi Campbell and musician Tinie Tempah. The music star is also the first African artist to walk the runway at a Dolce and Gabbana fashion show with his music `Soco’ played at the background.